Koh Mak (Thailand) – July 7, 2017 (travelindex.com) – Here is a unique chance to create your own paradise on the unspoilt Thai island of Koh Mak, a short flight and ferry ride from Bangkok. The Siam Royal View Group, who have successfully launched resorts in neighboring Koh Chang and Pattaya, are offering a prime piece of beach land of 270 Rai (430,000 m2) located on Koh Mak in the Gulf of Thailand. This land will allow buyers either to enjoy an exclusive lifestyle in complete privacy, or an investor to develop a starred resort second to none in the region. SRV has developed a master plan which includes a 200 room Beach Resort, 100 Villas and 150 condos for sale and for rent, plus restaurants, bars, a spa, a golf driving range and other resort facilities. Uniquely the development plan also includes space to create a 750 metre airstrip suitable for light aircraft along with hangars. The Land is situated on the north eastern tip of Koh Mak, offering exclusive privacy. Within a 20 miles radius are over 50 secluded islands, making this region one of the best cruising areas in South East Asia. For the investor, SRV along with the Signature Collection, a reputable hotel management company, will be on hand, if needed, to create this project as a joint venture and/or in a consulting role. The full resort could be up and running within 2 years, generating substantial profits, with projections demonstrating returns on investment above 20% p.a. The tourism on Koh Mak has primarily been limited by the available rooms, and occupancy rates have increased in spite of the additional rooms added in past years. 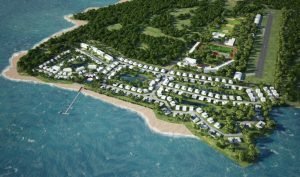 The Beach Resort and village proposed will significantly increase the available rooms on Koh Mak (approx. +20% in Phase 1). The land alone is being competitively offered at THB2.21Million per Rai (US$39.5 per m2) against rates of THB5-10M per Rai on neighboring Koh Chang and upto THB15-40M per Rai on Samui or Phuket. For US$ 17,000,000, you with your family and friends could be flying in to your own island hideaway for the most memorable vacations.